The flashlight is pushed through one of the holes and secured to the side of the milk carton. 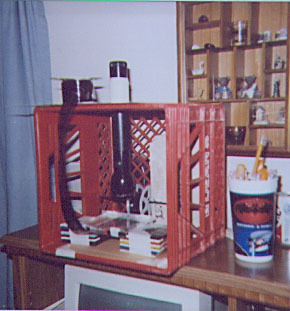 The loaded film roll is slid over a section of a rifle cleaning rod placed in the back of the milk carton. 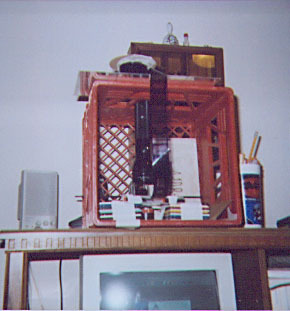 The film is manually pulled between 2 cd case covers taped face to face and are sitting on two stacks of 3.5 inch floppies for the focus height above the lens. Under the cd covers is the telescope eyepiece in a round hole cut into a piece of cardboard. The takeup roll on top of the milk carton is made of 2 round pieces of cardboard taped to a 35mm film canister. Dean hangs it over the edge of his desk so the film image shines down on the desktop in front of his computer and he types the info right off the film. There is a slab of marble for weight inside the milk carton to keep it from falling over on his head.